WEBCOL™ Alcohol Preps : Balego & Associates Inc. - BalegoOnline.org, Providing the Products You Want and the Services You Need Since 1984. 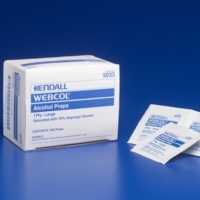 WEBCOL™ Alcohol Preps are available in a variety of sizes. All preps feature a premium, nonwoven pad material saturated with 70% isopropyl alcohol for effective scrubbing and cleansing. There currently are 1366 guests online.